The Connecticut Prison Association, a non-governmental organization in existence for over 140 years, is a unique agency in the United States, the world's leading jailer of its own citizens. Now known as Community Partners in Action, the organization's mission is to be a "unique, private agency, independently operating in Connecticut, concerned with personally helping individuals from the time they are accused of a crime, during such time as they may be committed, and after their return to society as free citizens." CPA has been intimately intertwined with the Connecticut criminal justice system for over a century, and during that time has influenced policy and changed many lives. 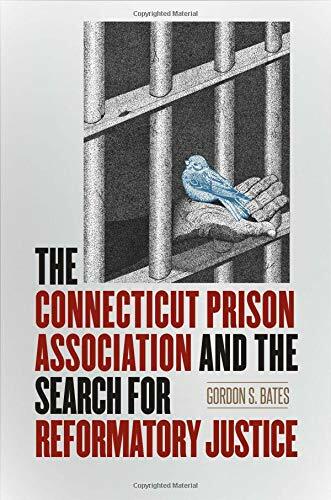 In his new book, The Connecticut Prison Association and the Search for Reformative Justice, former executive director Gordon S. Bates provides a detailed and thoroughly readable history of both CPA and the criminal justice system in Connecticut. From Newgate Prison, opened in 1773 and to become one of the most dangerous, inhumane and notorious prisons the world over, to the use of sterilization and eugenics in the early 20th century, all the way to the creation of the Connecticut Department of Corrections in 1967 and the modern state of the correctional complex, Bates covers Connecticut's criminal justice history completely, warts and all. He also explains and analyzes CPA's involvement in this process. The development of the criminal justice system in Connecticut, and nationwide, has involved a longstanding debate over the very meaning of justice. The dominant justice "options" in this country have always been retribution and rehabilitation. Historically, there has been significant friction between the two concepts. Bates argues that this is so because "[r]etribution (including incapacitation and deterrence) and rehabilitation capture in a unique way the basic dilemma encountered in a community's response to crime. Is it more effective and morally justified to punish offenders or to work with them? Can both be accomplished simultaneously?" With its roots in Puritanical religion, Connecticut's criminal justice policies have leaned toward retribution, as have the nation's. Organizations such as CPA push for the use of rehabilitation and restoration in criminal justice policies, but these are difficult fights. There have been great successes, such as the mid-twentieth century focus on rehabilitation, but as Bates points out, rehabilitative policies are fragile, as "one heinous crime can change public opinion in the course of twenty-four hours." This reality highlights the importance of NGOs such as CPA. Popular fear, as opposed to reality, is a pervasive driver of political action. Additionally, government movement is slow and can be limited in many ways. As such, the importance of private agencies in the realm of criminal justice practice and reform cannot be overstated. "The process of legislatively establishing state policies and organizational structures is very often a fragile endeavor, easily fragmented or abandoned because of intensive rivalries and personal agendas at odds with the welfare of the community," argues Bates. "Legislation, in fact, can falter at the last minute because of arguments over a sentence, a phrase, even a word. A voluntary agency is able, in many ways not open to public agencies, to quietly explore the changes and compromises needed to meet new demands, to test new solutions to problems, and to search for the best methods to achieve a more just criminal justice system." In Connecticut, agencies such as CPA have helped push the criminal justice system back onto the path of rehabilitation. Governor Dannel Molloy's "Second Chance Society," which champions rehabilitative and restorative justice, is evidence of Connecticut's current direction. Bates argues that Connecticut's movement is also because "[t]he tendency to allow criminal justice policies to be based on a simple-minded division of people into rigid categories of good and bad, law-abiding and criminal, moral and immoral has largely spent its intellectual reserves, leaving behind a trail of multigenerational racial injustice and an unsustainable system." The question remains, however, whether the simplistic and erroneous tendencies that have driven the criminal justice system thus far have spent their popular reserves. As Bates points out repeatedly, criminal justice reform is perennially fragile, always subject to a reversion to unjust, racist and wrong-headed policies based on popular reaction and popular fear, an ill wind years of progress is capable of undoing. With agencies such as Community Partners in Action on the job, however, there is hope. Whether intentional or not, Bates makes a clear and convincing case for the necessity of NGOs such as CPA. For that reason alone, The Connecticut Prison Association and the Search for Reformative Justice belongs in the pantheon of criminal justice scholarship.